Right on schedule, at 7:30am Sunday morning, February 28th, the new operating room lights were turned on by Hadassah National President Ellen Hershkin, and the first patients were wheeled into the new underground operating theaters of the Hadassah Medical Organization’s Sarah Wetsman Davidson Hospital Tower. 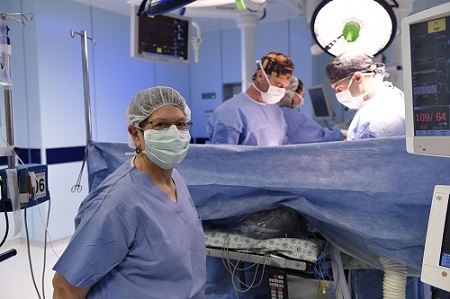 “We need to thank the women and men of Hadassah around the world who have always supported us for making this dream come true,” said Senior Surgeon Prof. Alon Pikarksy, who heads the Center for Colorectal Surgery. 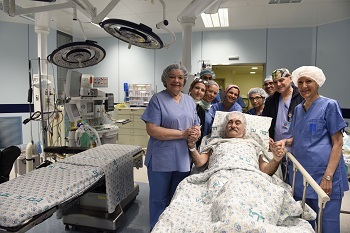 “You have so much to be proud of,” noted Zeev Markowitz, a retired builder from Brooklyn, father of seven and grandfather of 37, who was scheduled for one of the first operations in the new complex.